We're now just a few hours away from the last episode of the current season of Game Of Thrones, so it's a perfect time for a bit of a recap! 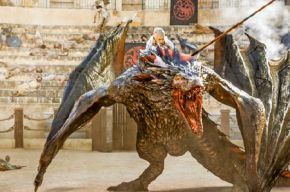 As much as I love love love Game of Thrones as a series, I do find that the first four or five episodes seem to take a while to get going, and this season was no exception to that. The first four episodes definitely set up each scene for future situations and re-connected us to our favourite characters, but they were a bit lack-luster. Everyone was travelling, meeting new people, getting into a bit of trouble... nothing that incredible. Then the last two episodes arrived and they have been amazing, and for completely different reasons! (Spoilers ahead.) Episode 8 finally showed us the full extent of the white-walkers and the horrific power they hold. We got to watch an intense battle scene between the living and the dead and I was on the edge of my seat. Episode 9 was split in two ways; one half horrific and one half epic. The ending was certainly epic, Drogon finally returned to the aid of Daenerys and we finally got to the see the pair take flight! This was a fantastic scene, which really captured the fantasy aspect of the series. However, before all the epicness of flying dragon-queens, we sadly had to watch as Stannis sacrificed his only daughter, Shireen, to the fire-god. This was the horrific side to the episode. We get to know and appreciate a character and then they're suddenly gone. This scene was really awful to watch but I think we're all used to Game of Thrones shocking us by now. I doubt many viewers are backing Stannis for king anymore. Now we're up-to-date, and who knows what's going to happen in the last episode! ?, I'm hoping for more epic scenes to come from Meereen. It's great that Daenerys has now finally met Tyrion, but I would appreciate it so much if she actually got just a little bit closer to Kings Landing. Fingers crossed! One thing's for sure, I can't wait to see what the season finale has in store. What are you most looking forward to? Comment below! (No book-spoilers please).